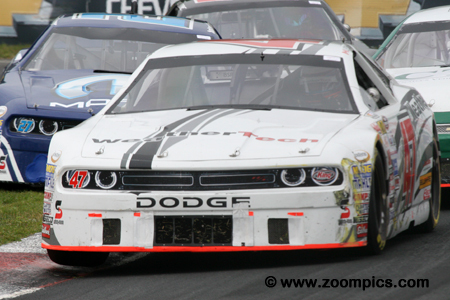 The NASCAR Canadian Tire Series made their second visit to Canadian Tire Motorsport Park at the end of August. The penultimate round of the championship had a total of twenty-nine starters – ten of which were rookies. As in May, the Clarington 200 would be 51-laps (200-kilometers) around the 2.459-mile, ten-turn road course. 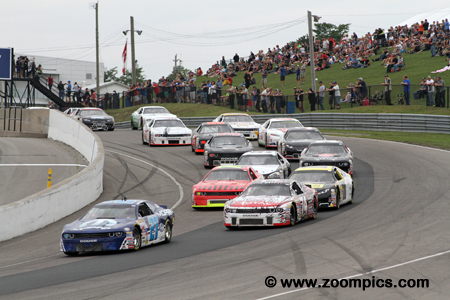 Corner one and the start of the penultimate round of the 2015 NASCAR Canadian Tire series. Pole-sitter Andrew Ranger in the No. 27 Mopar/Pennzoil Dodge Challenger jumps into the lead. 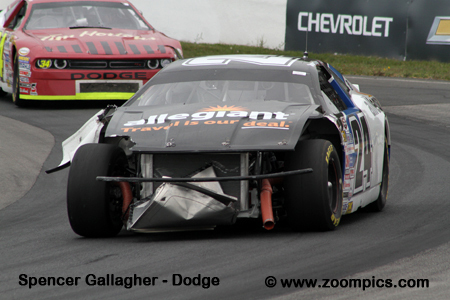 Front row starter, Kevin Lacroix in the Auto Parts Plus/Total Dodge Challenger, is about to slot in behind Ranger. 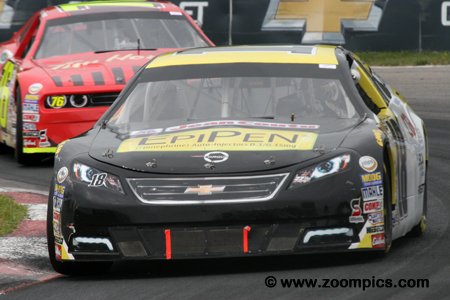 Following the lead pair are third and fourth place qualifiers – Jeff Lapcevich and Alex Tagliani. 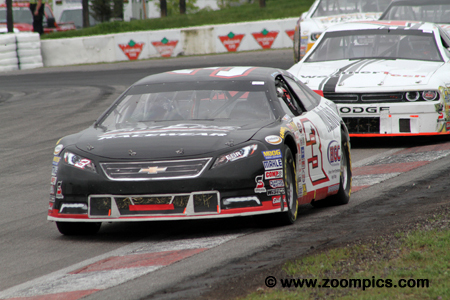 Known for his driving skill as an ‘oval competitor’ rather than a ‘road racer,’ Jason Hathaway did well qualifying the Muskoka Aircraft Center/HGC Chevrolet Impala in the tenth position. Hathaway improved on his starting spot during the race and was in the lead by lap-48. 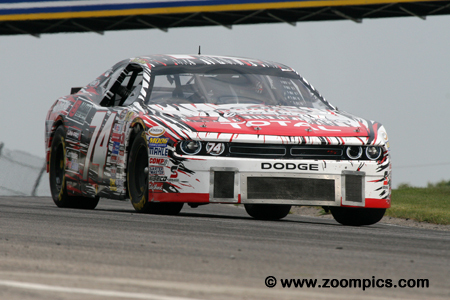 Despite challenges from Louis-Philippe Dumoulin and Jeff Lapcevich, he held on to score his first road course victory. At the end of the final 50-minute practice session, Andrew Ranger was the quickest driving the No. 27 Mopar/Pennzoil Dodge Challenger. During qualifying the two-time NCATS champion would remain at the top of the time sheets and start Sunday’s race on the pole. Ranger was a contender during the contest but a flat right rear tire eliminated any chances for a victory. At the finish, he was in sixth place. Defending champion Louis-Philippe Dumoulin did not participate in the final practice session (due to a mechanical issue under the hood) and that may explain the poor qualifying result. The driver of the No. 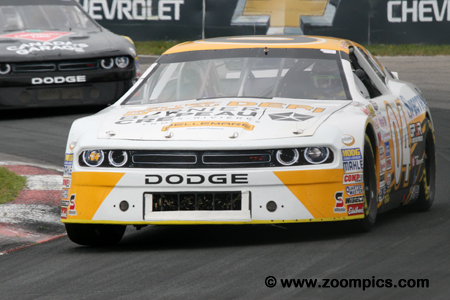 47 WeatherTech Canada/Bellemare Dodge Challenger qualified thirteenth. In the race, he received a penalty for excessive pit lane speed. He was able to overcome this setback and captured the runner-up spot. Scott Steckly driving the Canadian Tire Dodge Challenger was quick throughout the weekend and in qualifying recorded the sixth fastest time. At the checkered flag, Steckly was in the seventh position. Despite this result, he still maintained the championship lead with one event remaining, although Hathaway’s victory reduced his advantage to just eight points. Jeff Lapcevich’s early motorsports career included a stint competing in various showroom stock series. 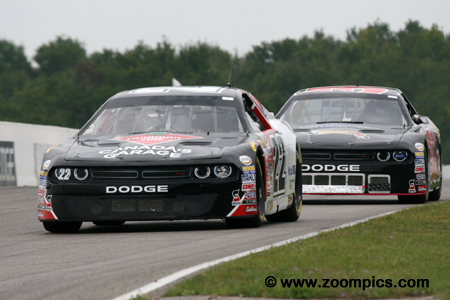 Each time the NCATS participated at Canadian Tire Motorsport Park, his road racing skills were evident. During practice, he was always near the top of the time sheets and qualified third. With 34 of 51-laps completed, Lapcevich moved into first place but contact with Tagliani dropped him to fourth on lap-42. At the checkered flag, he finished third. Another driver with plenty of closed wheel road racing experience is Jean-Francois Dumoulin – brother of the 2014 champion, Louis-Philippe Dumoulin. Jean-Francois qualified immediately ahead of his brother in twelfth place. A steady performance and the misfortune of his fellow competitors allowed Dumoulin to capture fifth at the checkered flag. Veteran D.J. Kennington qualified the Castrol Edge/Mahindra Tractors Dodge Challenger in the eighth grid position, however, he was required to move to the rear of the grid due to unauthorized adjustments. Kennington worked his way methodically through the field and was rewarded with a fourth place finish. 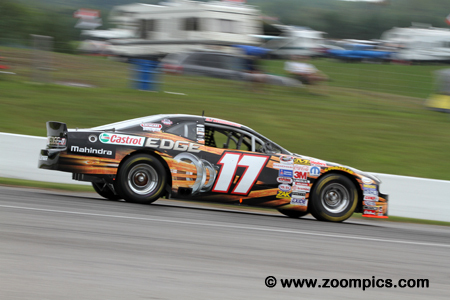 Circuit ICAR and Trois Rivieres winner, Kevin Lacroix turned the second fastest time during the qualifying session. 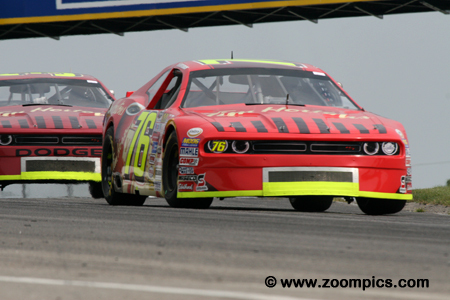 Early in the event, Lacroix followed the leader Andrew Ranger and made a successful pass for first on lap-15. Unfortunately, Lacroix’s glory was short lived as he retired after twenty laps with a clutch issue. With his extensive background in open and closed wheel professional road racing series, it was no surprise to see Alex Tagliani qualify fourth. 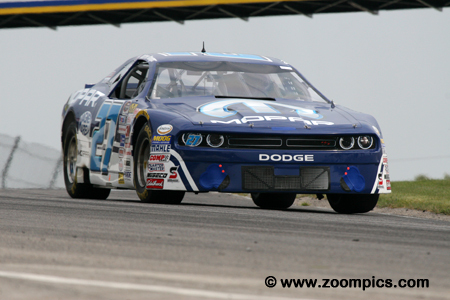 At the second event of the season, Tagliani lapped the entire field on the way to victory – this was a first in the NASCAR Canadian Tire Series. He was in contention during round ten but contact with Jeff Lapcevich while contesting the lead dropped Tagliani down the race order – he finished eighth.